Something about that just sounds yum. And no, I’m not intentionally trying to start a rhyme. Ready to get your drink on? Or maybe you’re just looking for the perfect party drink ideas? I’m not a huge mixed drink person, but when we have people over I tend to mix up a batch (or two or three) of margaritas, Mimosa, Sparkling Rum Mojito or one of these lemonade cocktails for the ladies. The guys normally tend to stick to beer, and that is fine by me because it means more girlie drinks for me and my gal pals! Summer cocktails by the pitcher start with our Strawberry Rum Punch Recipe. Delicious! And… I’ve finally found the perfect glasses to help us celebrate the night in style. In honor of the ‘End of Summer Girls’ Night’ we had last week, I created a sweet and tasty Strawberry Limeade Rum Punch in my fun punch dispenser. I’m even thinking about getting a second party punch dispenser. It would definitely come in handy if I wanted to serve another cold drink. So, of course I tested out the punch a little bit while I was cooking up some great food. I’m not going to lie. I struggled between pairing up our Strawberry Limeade Rum Punch with either one our amazing indoor shrimp boils or grilling out. I make a mean grilled chicken and even better perfectly grilled ribs, so it was a tough decision. And if you’re thinking these are great ideas to keep on hand strictly for the summer- think again. I’ve seen many a people up here in Wisconsin grilling out in the dead of winter, and I’m thinking about joining them! Don’t be fooled by the lack of high octane rum flavor, because this punch has a kick. 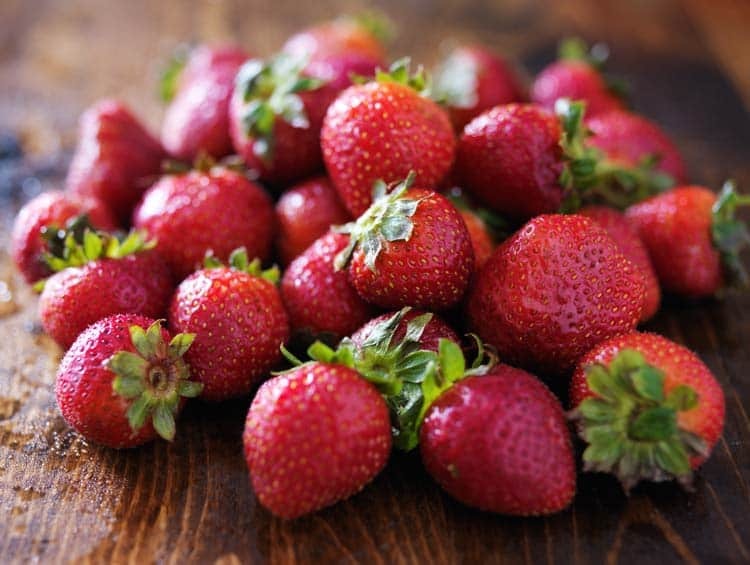 And, if you’re like my friends and decide to dump out all the fruit once you get to the end of the pitcher (or bowl) just to sample the rum strawberries… well, watch out! You’ll definitely get your drink on. This is the perfect solution to summer party drinks for a crowd. Fruity drink recipes require just a few ingredients. Which make them easy to whip up in a breeze. Which is. Perfection. This is a super simple drink to throw together and can even be tossed together at the last minute if you happen to have the ingredients on hand. All you need: A large drink dispenser, Rum, frozen limeade concentrate, frozen Bacardi Strawberry Daiquiri concentrate, ginger ale, and some limes, strawberries, and lemons to make it all look pretty. Throw in some sphere ice cubes to keep it cool, and you’re stylin and ready to go! And the fruit really does add some flavor, so don’t skip that step unless it is a drink emergency. Because really, fruit is an essential part of fruity drinks, you know? And if you’ve ever thrown berries into a glass of wine (making it a delightful sangria-flavored surprise), you know what I’m talking about. Berries make everything better. Okay… maybe not everything, but they definitely work in this drink. Ready for the recipe? You’ve got it below! Now… go have fun and drink responsibly. Seriously, before you get started mixing up the most perfect rum punch ever, think about this: what are you going to serve for food at your big shindig? You’ve got to have food for your peeps to eat, don’t you? Here are a couple suggestions to get you going. Looking for something you can serve inside or out? 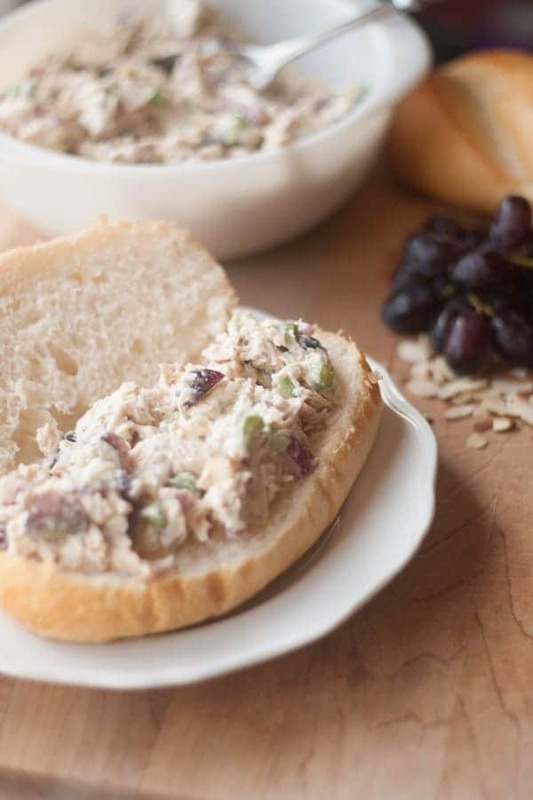 We’re pretty partial to the best Chicken Salad Sandwich recipe we’ve ever made or tried elsewhere. It is seriously that good. You’ll LOVE it! Whatever food you decide to serve at your party, just know you’ve got the perfect sweet and fruity drink to serve up alongside it! It’s always a good idea to have a party punch or a cocktail at your gatherings. Sure, beer and wine serve their purpose and they can be absolutely great…but a nice drink like our Strawberry Limeade Rum Punch makes a gathering a party. And that’s what you wanted, right? As always, remember to drink responsibly! Check out our video below that shows just how to make our nearly famous Strawberry Limeade Rum Punch. It’s really quite easy to make and SO utterly delicious to drink! Strawberry Limeade Rum Punch party punch recipe perfect for summer cocktails by the pitcher if you want to serve alcoholic party punch recipes. Thaw frozen concentrates and then mix all ingredients together in a punch bowl or other beverage dispenser. Add ice and serve. This drink is right up my alley! It sounds really refreshing and tasty! OK you had me at “RUM” lol no really this looks Yummy and it has all my favorites:) Great job. This drink looks amazing, Jessica, and you are right, totally perfect for entertaining! Pinning! This was to die for!! Made it for Christmas dinner. We did 2 versions, one without the rum for the kids (used water instead), and everybody loved it. Thank you!! I usually use light rum, but you can use either. It’s yummy! I have a quick question when you thaw out the frozen juices and you’re preparing this punch do you add water to this recipe? Like when you’re making concentrated juice the cab requires about 3 or 4 cans of water. Do not add water to the recipe! It is just the frozen concentrates and then the soda and alcohol. Thanks! This would be perfect for my next girl luncheon! So clean and refreshing and loving that rum! Hello? I don’t have any regular rum on hand, only cocoanut rum. Would that tats ok or should I pick some regular rum up at the store? Thanks! Hi Amber, I have not tried it with coconut rum, but with it being such a fruity tropical type drink, I think that coconut rum would go really nicely. The end flavor will of course be a bit different than the drink I made, but I think it would still be really good. You can always add more of this or that a little at a time and taste as you go to make it just right. Just don’t get carried away before the party gets started. 😉 Have fun and enjoy! That looks delicious! It’s funny how the boys always drink beer isn’t it? I bet they secretly want the ‘girlie’ drinks! This looks really good! I have a birthday party coming up and I’m looking for a batch of something easy to make so everyone will have something to drink on. How much would you say it makes? Hi, this looks delish. 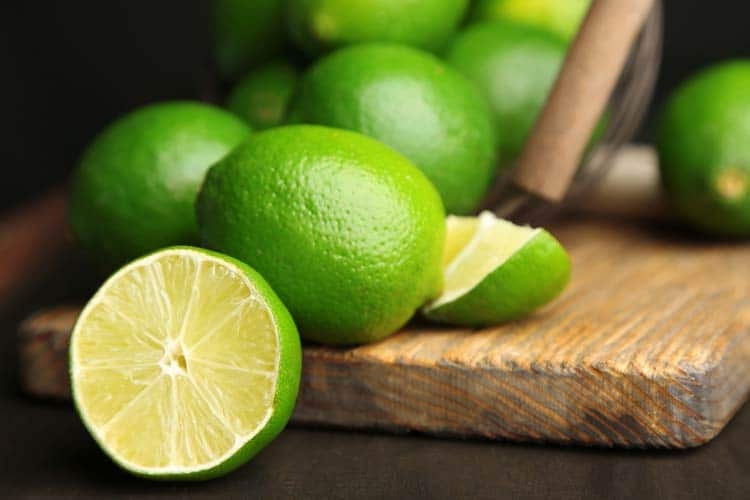 Could you substitute the limeade with lemonade, have you ever tried that? (Having a hard time finding the frozen limeade). You should be able to, although it would have a different taste. I think it would be just as good! Hi I was wondering about how many servings does one batch of this make? I made this for a party I had. I didn’t make any changes to the recipe and everyone loved it. It’s a really refreshing drink. Thanks for sharing! 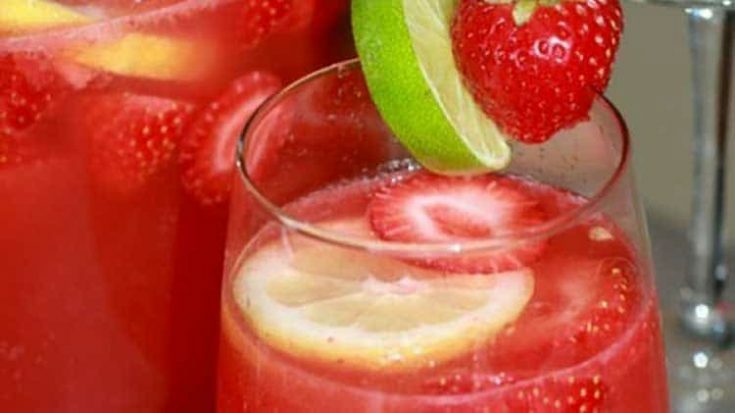 I love strawberry drinks, this sounds so delicious and refreshing! Thanks for sharing at What’d You Do This Weekend? I hope you will join us again this Monday! Rum punch sounds fabulous! I’ll be trying this one poolside this summer for sure! Pinning! Yum Yum Yum is all I can say! Looking forward to making this soon. Hi, this drink looks great, but I was wondering if you could substitute rum for tequila? Hi, this drink looks great, but do you think I could substitute rum for vodka? Maybe strawberry vodka? For sure! You should be able to substitute either. It won’t taste exactly the same without the rum, but it should be equally tasty! Is there a specific kind of rum you used for this lovely drink? Fruity drinks are my favorite! This looks amazinnggg! Yum. I could use this drink right now. Makes me want to run to the strawberry stand for some fresh berries. Thanks for shairng this on Merry Monday. strawberry limeade rum punch looks delicious, thanks for sharing with Hearth and soul blog hop, pinning and tweeting. My husband just bought a dispenser that he planned to use for lemon water but I think I just found a better use for it! 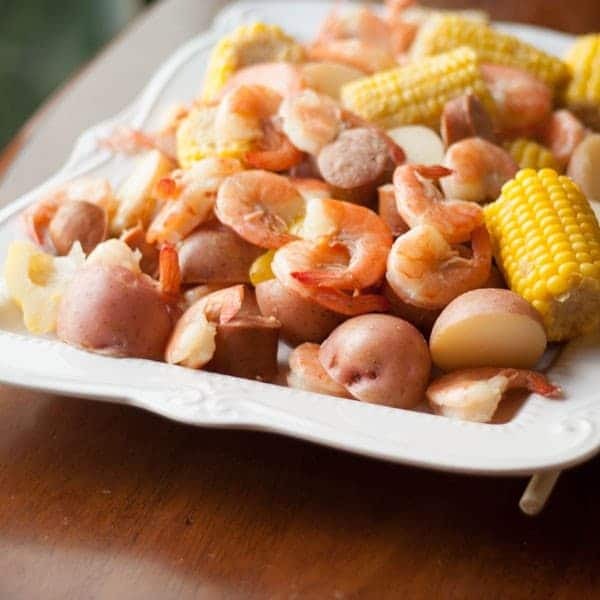 This looks yummy and perfect for warmer weather. Thanks for sharing at the Blogger’s Pit Stop. This drink sounds so refreshing and yummy! Thank you for joining us this week at Thursday Favorite Things Blog Hop. What beautiful cocktails! I love how you have garnished them – and what a great flavour combination! Thank you for sharing with us at the Hearth and Soul Hop. That looks so delicious! We are suckers for strawberries around her and this would give the adults a little extra kick 🙂 Thanks for sharing! Hi! I just saw this recipe and it looks delicious. It would be great at our 7/4 party. My question is do you know approximately how many it would serve. And do you only use 1 – 2 liter bottle of ginger ale? It seems like there is not too much liquid? Is it very sweet? It’s a sweet drink, but not overly so. When I make it, I typically double the recipe if we have several people around. Also, it’s an easy recipe to buy extra ingredients for so you can mix up a fresh batch if needed in a jiffy. 😉 Enjoy! I have been trying to get to cleaning section. Other than a list of ways to clean, the clean tip I click on goes back to the first page that tells how to make a strawberry drink. I cannot open any of the ways to clean. I’m especially interested in cleaning with vinegar. Thanks for letting me know. I will work on fixing the links so they all work correctly, but in the mean time you can search for what you’d like to find in the search bar on the side of the page. I’ll get the links worked on next week after the 4th of July holiday. Again-thanks for the heads up!! I made this today at a football party with my girl friends. They all loved it. I used bubbly Canada Dry ginger ale and Bacardi white rum. I’m not sure what others used for rum. I took a shot in the dark since I’m not familiar with rum. It was so delicious and I will be making it again!! Would like to serve it at a Baby Shower Cocktail Party. I would serve it as a mocktail (no rum) for the Mom to be & with alcool for others. – Do we add water to recipe (limeade & Frozen Bacardi instructions) or is that replaced by ginger ale? – Have you tried with no rum? Thanks. No water is added. I have not tried it without rum, but I imagine it would be wonderful! I have a 2 gallon drink dispenser. I am making this recipe for our happy hour at the office this evening. Do I need to buy double of everything to make 2 gallons? I have cheery rum. Would that be ok or do I red to go buy regular rum? Cherry rum? That should add a fun flavor!